While Friends of the Underline plan the transformation of 10 miles’ worth of land under Miami’s Metrorail, a University of Miami architecture class is helping out by visualizing the transformation of the Brickell and University Metrorail stations. Professor Jacob Brillhart got involved after a different UM class taught by professor Rocco Ceo worked with the Underline last spring. That class had students designing mile-long sections of the 10-mile project and the work they did has provided a base for Brillhart’s class. “They came up with a master plan but they felt it needed a bit more development, so they thought, why don’t we run one more course?” Brillhart said. Meg Daly, the Underline’s founder, wants to turn Metrorail stations into attractions, which she hopes would help get more commuters to use the Metrorail and help cut down on car emissions. The Brickell and University stations were chosen as the focus of the class. The Underline recently announced five design consulting firms as finalists to design the official master plan, but the work done by these classes will be presented to the public and the firms. Brillhart hopes they will use some of the ideas that develop from his class designs. A separate class taught by professor Charles C. Bohl is looking at the real estate and urban strategy issues involved in a project like this, according to Brillhart. The zoning around the Metrorail stations has been cited as a major obstacle. Supporters of the project hope the city will allow commercial zoning to promote business around the stations. Natalie Paulino, one of 13 students in Brillhart’s class, believes the Underline is just what Miami needs as the city’s population grows and commuting in a car becomes harder. Acccording to Paulino, their research found that transit stations are used in more ways than just transportation. “A train station functions as a social gathering point, a commercial center and public space,” said Paulino. 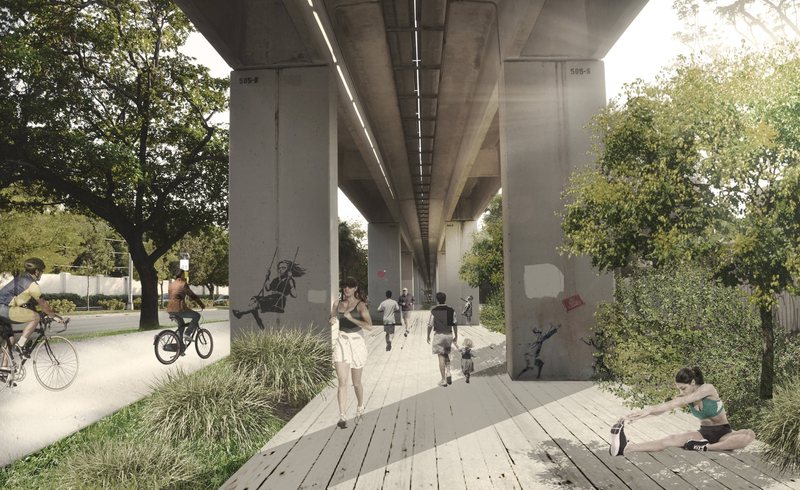 Funding for the Underline’s master plan has been completed, and the design consulting firm that will create that plan will be chosen soon. Daly hopes that after the master plan is presented in public hearings, funding for the construction can be garnered quickly. With the support of Mayor Carlos A. Gimenez and Miami-Dade County, Daly hopes they can begin construction by 2016 if all goes well.